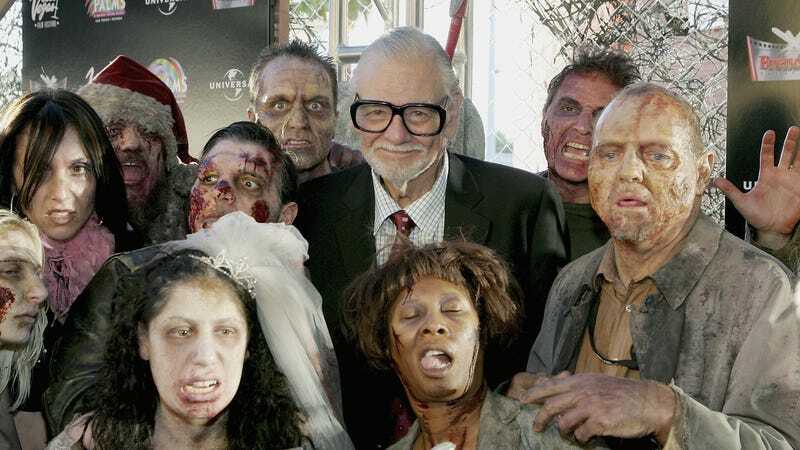 Much like with every other famous creator who has ever died, it sounds like George Romero left behind a vast archive of unreleased work that the people who control his estate are now looking to capitalize on. Speaking with ComicBook.com, Romero’s wife, Suzanne Desrocher-Romero, revealed that he had left “nearly 50 scripts” when he died, any of which “could one day be developed into films.” Dan Klaus is currently rewriting The Living Dead, a novel that Romero had been writing before his death, and Desrocher-Romero says that a movie he had been working on called Road Of The Dead is still happening (though it has “sputtered” recently). “George was a prolific writer,” Desrocher-Romero notes, “He loved to write, and we have 40, 50 scripts that he’s written, and a lot of it is very good.” She also adds that he “had a lot to say, and he still does,” so she’s going to make it her “mission” to ensure that Romero has a chance to tell the stories he wanted to tell before he died. Desrocher-Romero also has concrete plans to release a little-seen film that Romero made in 1973 that is “scary” but “not a horror movie,” and she says it’s about ageism.